This book, written anonymously in the 18th century, interweaves three of Judge Dee's most baffling cases: a double murder among traveling merchants, the fatal poisoning of a bride on her wedding night, and the suspicious death of a shop keeper with a beautiful wife. The crimes take him up and down the great silk routes, into ancient graveyards where he consults the spirits of the dead, and through all levels of society, leading him to some brilliant detective work. If you could sum up Celebrated Cases of Judge Dee (Dee Goong An) in three words, what would they be? Cross-Cultural, Complicated, Clever-- add Chinese! The judge switched from case to case and they all seemed unrelated and insoluble, but in the end, although the crimes occurred over great distances at times, they seemed to all fit together into an intricate pattern. And the Chinese practically invented paranormal mysteries! They are full of dreams and ghosts and visions of the afterlife. The most wonderful thing about these books though is not just that the stories are great mysteries, the atmosphere is evoked so well and the characters so memorable, but that it is based on a real historical person and the real ancient Chinese entertainment form of detective stories. The explanation of how these stories are converted to suit Western tastes is fascinating. I read these books in paper before taking a Chinese History class and found that the information on ancient Chinese culture contained in the stories was great preparation for the class. I liked the old guard who showed Judge Dee and his other officers to Turnip Pass. I found it very moving that the rule at the time--which Judge Dee was prepared to follow--was that if a prisoner was tortured and turned out to be innocent, the judge and his officers were to be executed in the prisoner's place. I imagine corruption of justice occurred anyway among lesser officials but if you followed the rules, you would be very careful. I wish today's justice were as scrupulous. 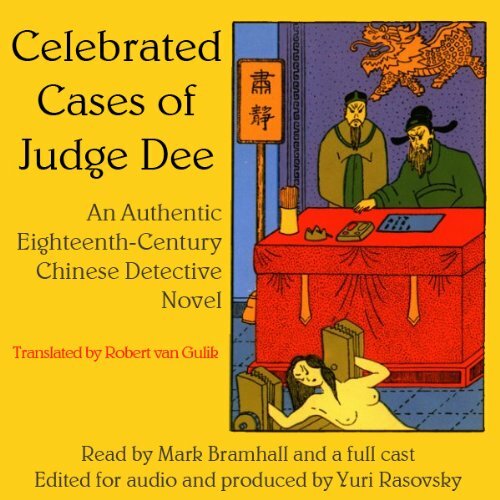 I want more Judge Dee audio books on audio please. Their cross cultural background and atmosphere is even better than the stories themselves and is the sort of thing that narration immerses you in even more completely than the written word. A fascinating look inside a legal system much older than our own. Two jarring notes to modern listeners, the use of torture in court, and Judge Dee's reliance on supernatural influences to move a case forward, were nevertheless parts of an administration of justice that lasted more than a thousand years. The performers did a good job all around, and I wish there were more Judge Dee books on Audible. I first read Judge Dee back on the 80's when I was looking for something different. These stories did not disappoint. I do not enjoy the tourture aspects, however, (even the U.S. Has recently practice tourture for ways and means, unfortunately). But these stories do show the wisdom of the Judge Dee in solving each problem and keep one in suspense in how he will eventually solve each case. I truly recommend these stories to anyone interested in something a little different and new. These stories are well written, placing the reader in the culture of the time. I encourage any mystery reader to give Judge Dee a try, I don't believe you will be disappointed. For those who appreciate the translations of van Gulik, this current work will please and satisfy. Very well narrated, the listener will be transported to an era long ago expired. The morals and lessons if the story fit both ancient times and current life. The listener will be left satisfied and wanting the story to go on. An excellent introduction to Judge Dee! I found both the Narration performance and the sound quality to be first-rate! I was at first worried that the advertisement of this being a "full cast" recording was false until I got further into the recording and discovered where the rest of the cast came in. This book us different from most mystery tales (as explained in the author's notes in the final chapter) but the story is very interesting and entertaining. So awful it was almost good! Well, this is listed as illustrating 'some brilliant detective work' .... well the judge seems to be ruled by what he 'felt' about the particular accused - no logical evidence shown - in fact it was so 'naff' that I almost enjoyed it! He was guided to his judgements by an explicit dream - which had to be explained to him by his sergeant. One REALLY irritating point though - the narrator would insist on talking about the 'constipals' rather that 'constables' and I found this really annoying. I bought this as part of an offer - thank goodness I didn't go to town using up my valuable credits. I really wouldn't recommend this to anyone! a really fascinating book as it takes you out of your comfort zone into an entirely different culture. this had the effect of making me take a look at our own traditions and also the literary conventions of our own detective fiction. this book does not conform in any way. the narration was a little irritating at first but perfect for the content as many audios are 'performed' which would not be appropriate in this case, bear with it, the book itself takes over very quickly. the three cases are all worked at the same time but are separate and Judge Dee has to face many challenges both from his superiors and of public opinion. the three plots are quite different yet combined in the time-frame give the book it's strength. the cherry on the cake is the commentary at the end which had so much information that I would have preferred it to have been at the start. I paid full price for this book and it was worth every penny. so, for those with open minds, go ahead you won't regret it. shame this is the only one. judge dee books are a great read. They capture a China echoes of which can still be seen today.